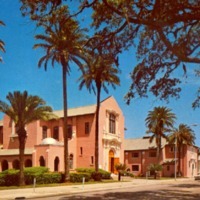 A postcard depicting the Peace Memorial Presbyterian Church (PMPC), located at 110 South Fort Harrison Avenue, in Clearwater, Florida. PMPC was chartered in 1891 under the name Clearwater Presbyterian Church. The church was later renamed the First Presbyterian Church of Clearwater and nicknamed the Little White Church. The church's current building was designed in the Mediterranean Revival style of architecture using pink stucco and is nicknamed the Big, Pink Church in Downtown Clearwater. Original 9 x 14 centimeter color photographic postcard by Ward Beckett: Private Collection of Bob Van Horn. Digital reproduction of original 9 x 14 centimeter color photographic postcard by Ward Beckett. Originally created by Ward Beckett. "Church History." Peace Memorial Presbyterian Church. http://www.peacememorial.org/ChurchHistory. Beckett, Ward. “Peace Memorial Church Postcard.” RICHES of Central Florida accessed April 21, 2019, https://richesmi.cah.ucf.edu/omeka/items/show/7552.